Once you are logged in, click through the steps below. 1. Start 2. Programs3.Microsoft4. 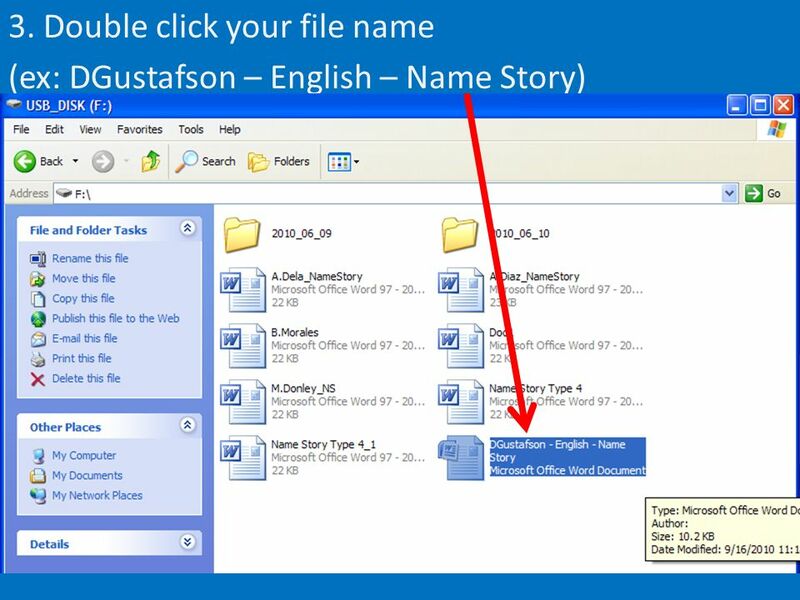 Word Menu Office2007. 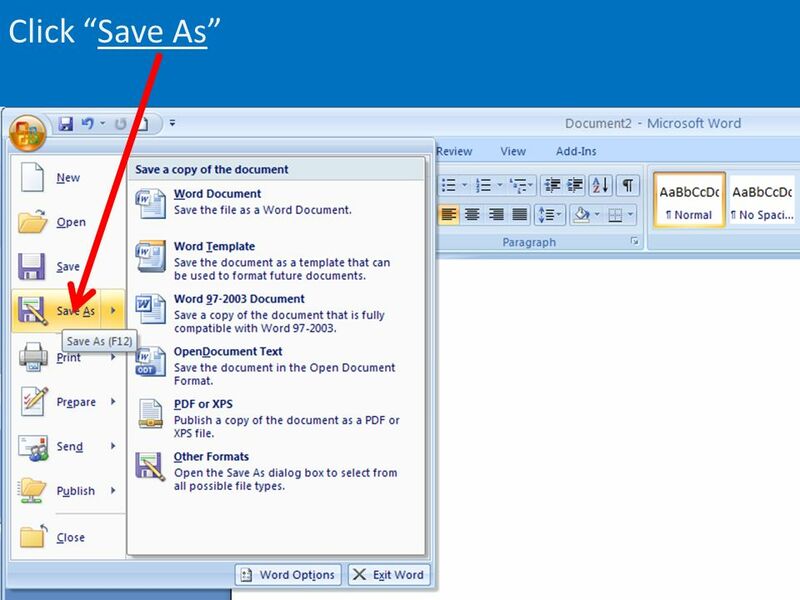 2 Saving Documents Once Word is open, your first step is to save your file. First click the Office Button or the File button on the top left of your screen. 4 Left click & drag the center bar until you see My Computer. 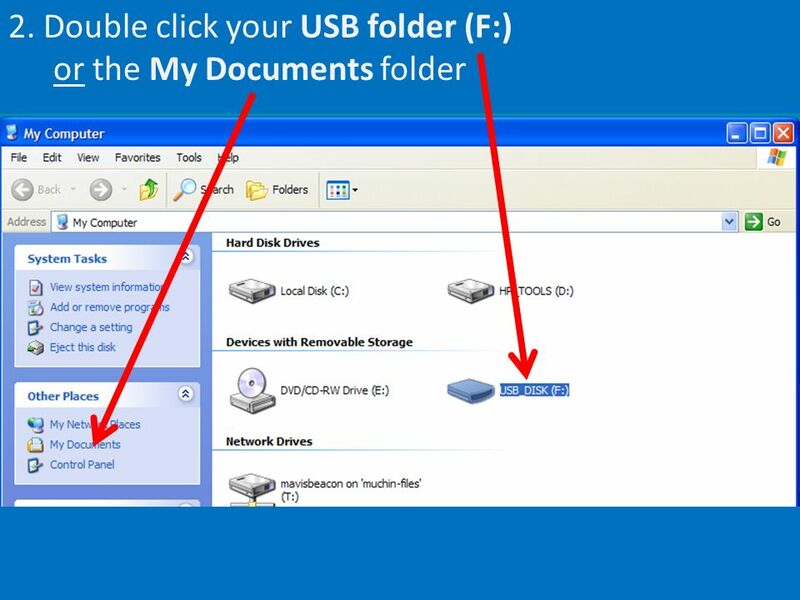 Under Computer you will see your jump drive. It may not have your name, but it will be a letter after (E:). 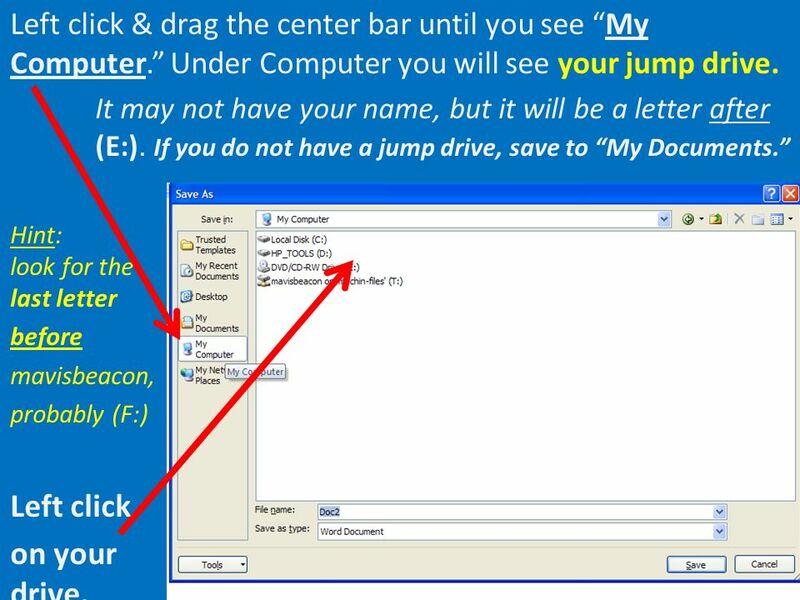 If you do not have a jump drive, save to My Documents. Hint: look for the last letter before mavisbeacon, probably (F:) Left click on your drive. 6 Click the red X (close) on the top right of the screen. 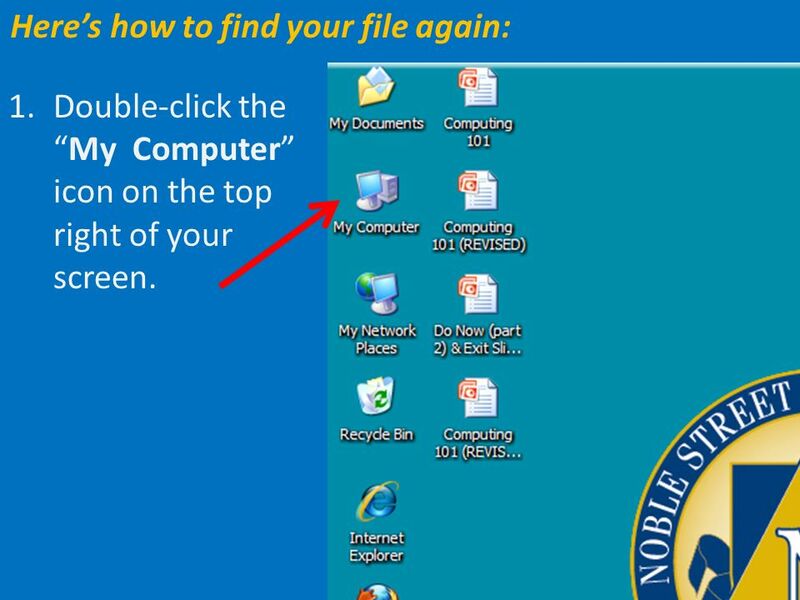 7 Heres how to find your file again: 1.Double-click theMy Computer icon on the top right of your screen. 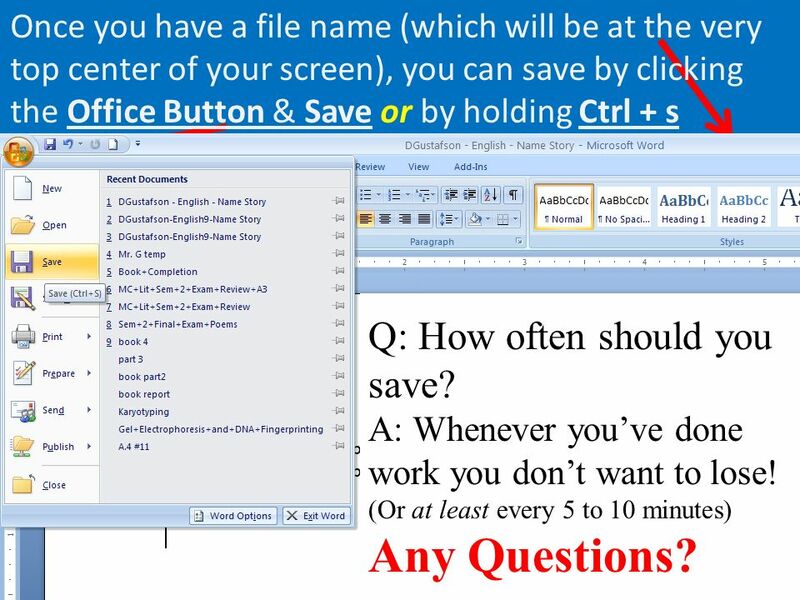 10 Once you have a file name (which will be at the very top center of your screen), you can save by clicking the Office Button & Save or by holding Ctrl + s Q: How often should you save? A: Whenever youve done work you dont want to lose! (Or at least every 5 to 10 minutes) Any Questions? 12 3. 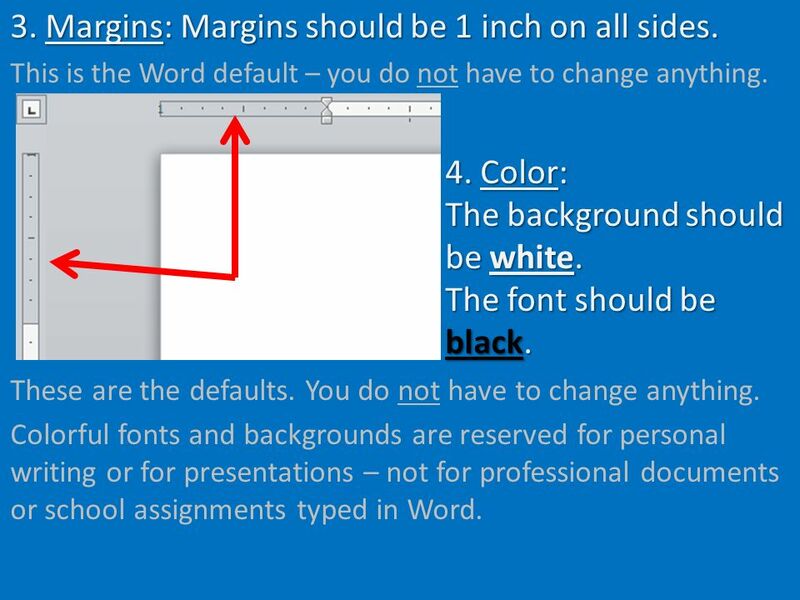 Margins: Margins should be 1 inch on all sides. This is the Word default – you do not have to change anything. 4. Color: The background should be white. The font should be black. These are the defaults. You do not have to change anything. Colorful fonts and backgrounds are reserved for personal writing or for presentations – not for professional documents or school assignments typed in Word. 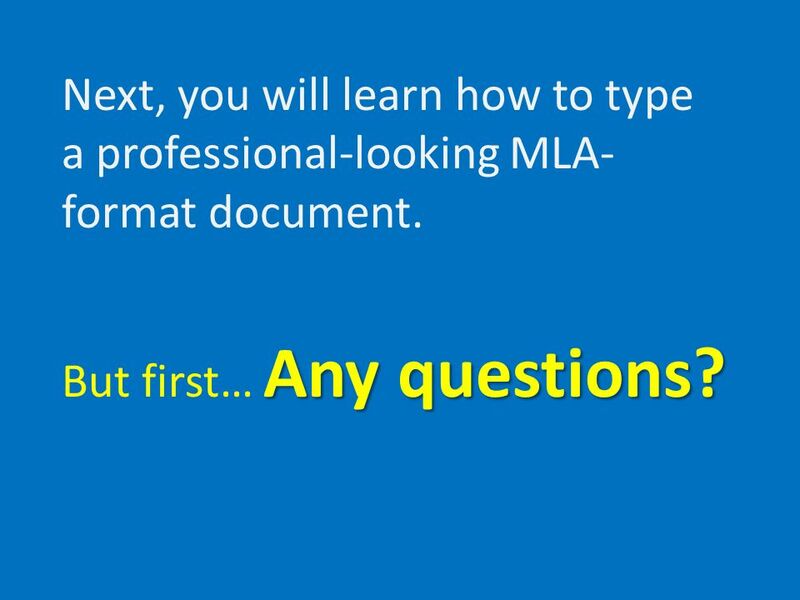 13 Next, you will learn how to type a professional-looking MLA- format document. Any questions? But first… Any questions? 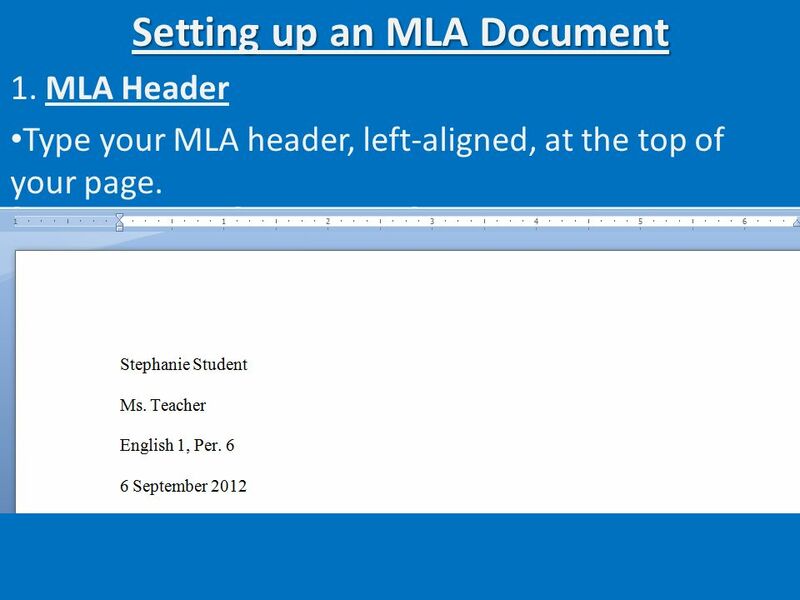 14 Setting up an MLA Document 1. MLA Header Type your MLA header, left-aligned, at the top of your page. 15 2. Spacing. 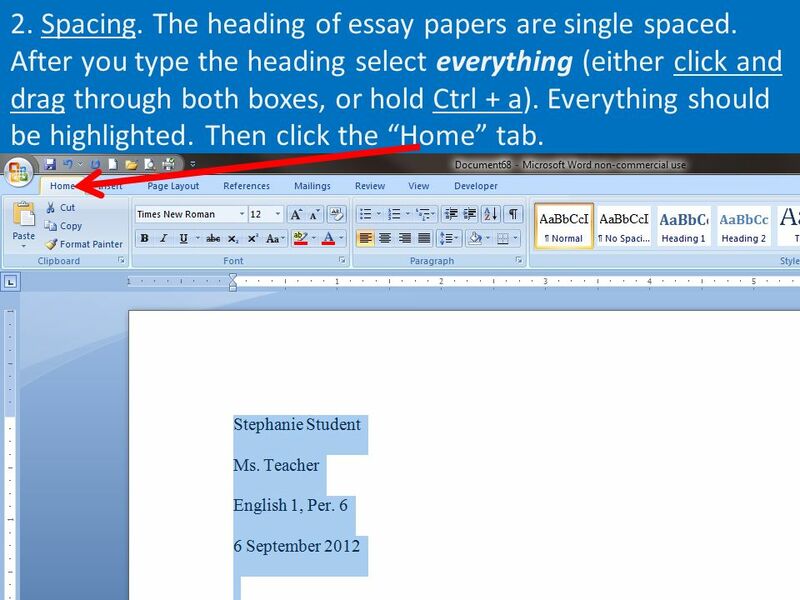 The heading of essay papers are single spaced. After you type the heading select everything (either click and drag through both boxes, or hold Ctrl + a). Everything should be highlighted. Then click the Home tab. 17 5. After the header, everything is double spaced, starting with the Title. 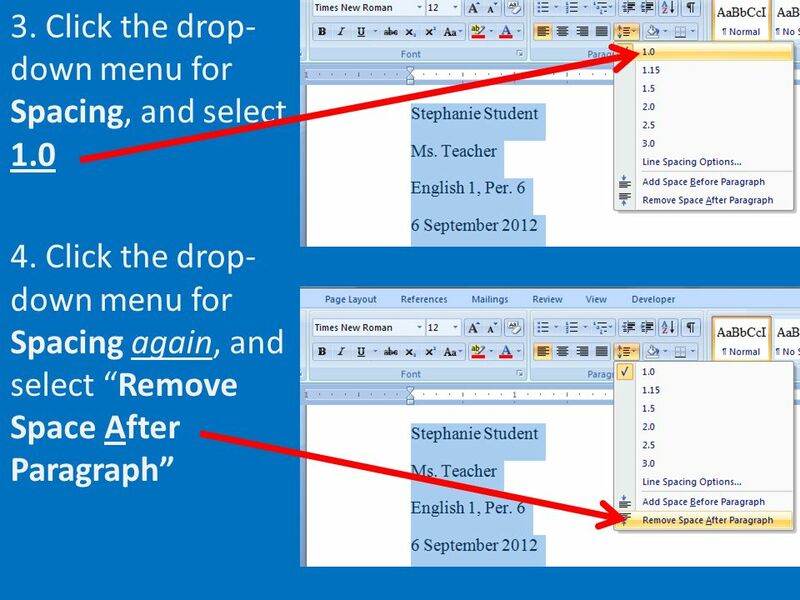 Click anywhere in the last line of the header and click 2.0 in the spacing drop-down. 18 6. Title. Type Enter once to start a new line. Then click the Center icon to center align. Type your title. (Note: this is different from the assigned topic.) Hit Enter. 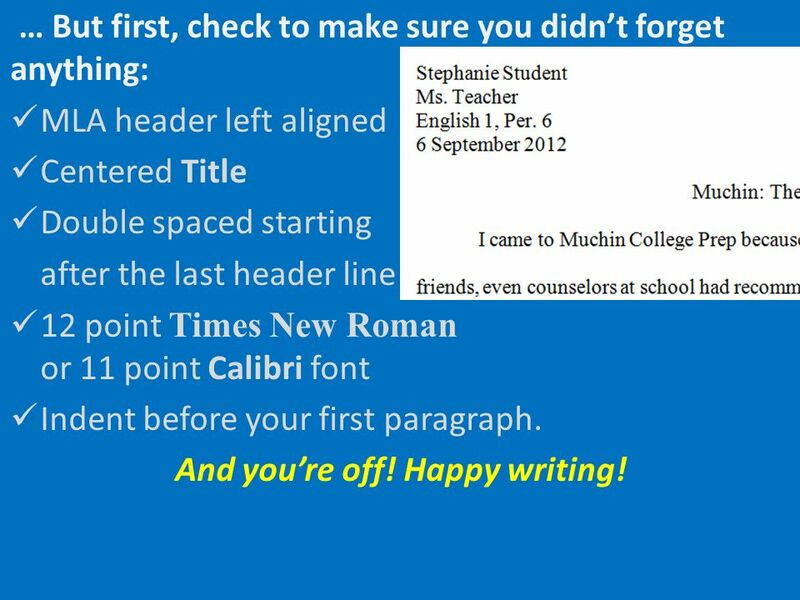 20 … But first, check to make sure you didnt forget anything: MLA header left aligned Centered Title Double spaced starting after the last header line 12 point Times New Roman or 11 point Calibri font Indent before your first paragraph. And youre off! Happy writing! 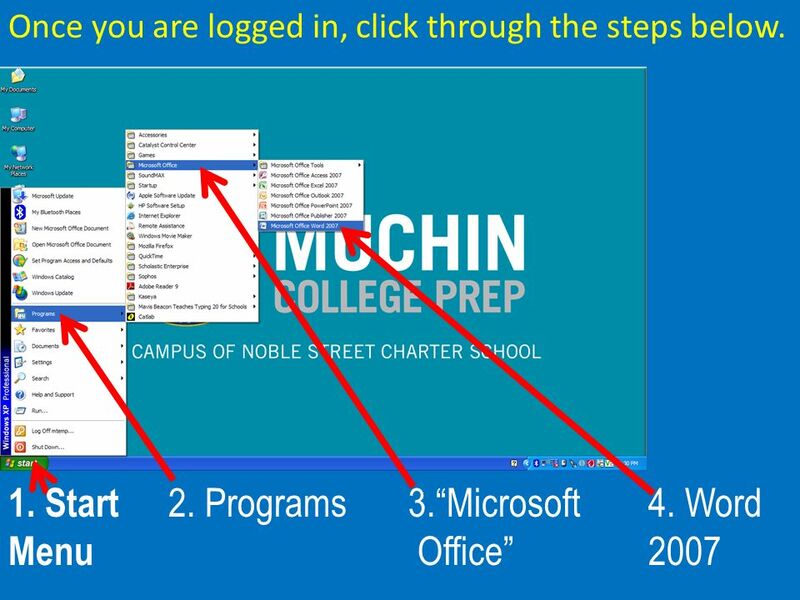 Download ppt "Once you are logged in, click through the steps below. 1. Start 2. Programs3.Microsoft4. 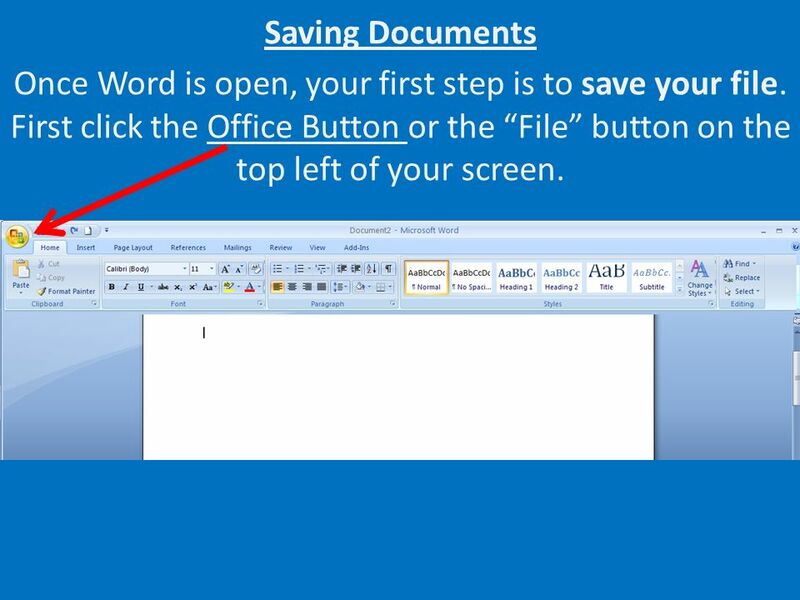 Word Menu Office2007." M A R G I N S Before you begin typing, format your margins. 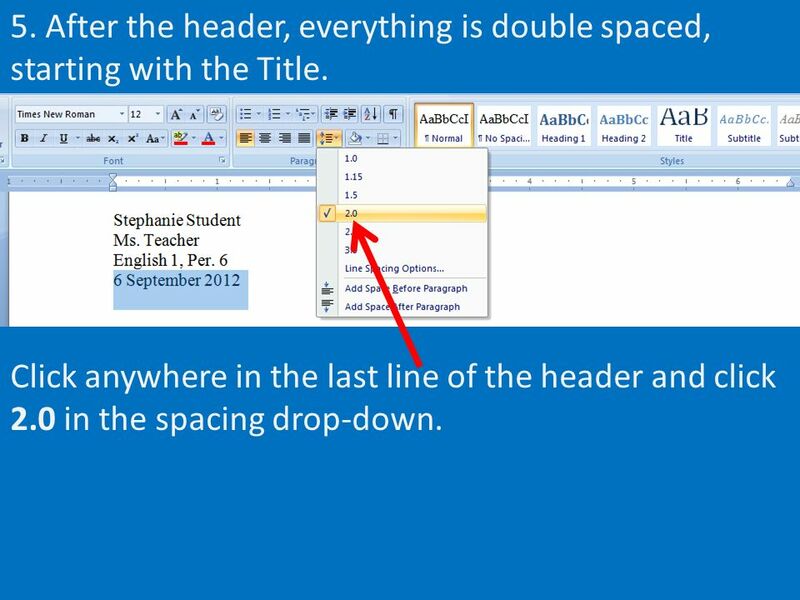 How to Add a Proper Heading To a Word Document Michelle Lowe – Media Specialist – 12/4/2013. The Basics. Margins  Page Layout Margins 1” Font  Default Home tab Font dialog box ○ Font: Times New Roman ○ Style: Regular ○ Size: 12 ○ Default. 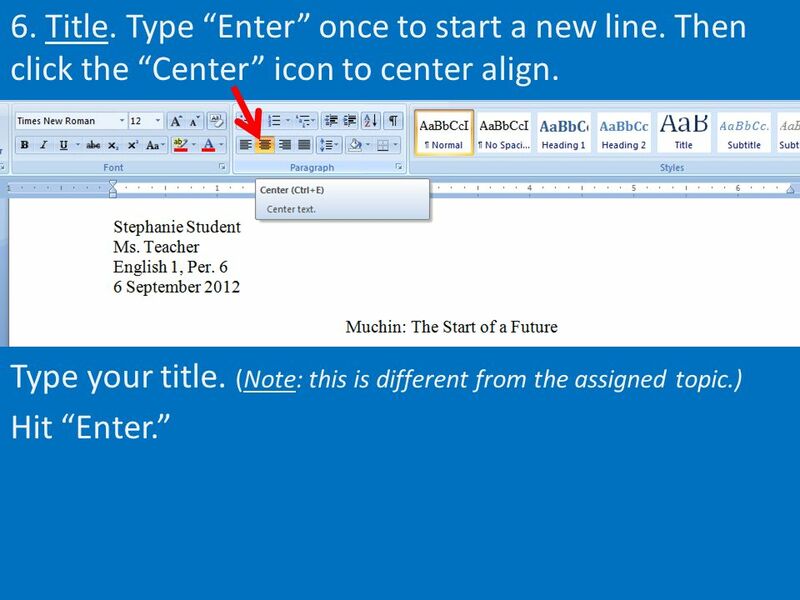 This will show you how to create a master template in word. The first thing you need to do is open up the word programme. 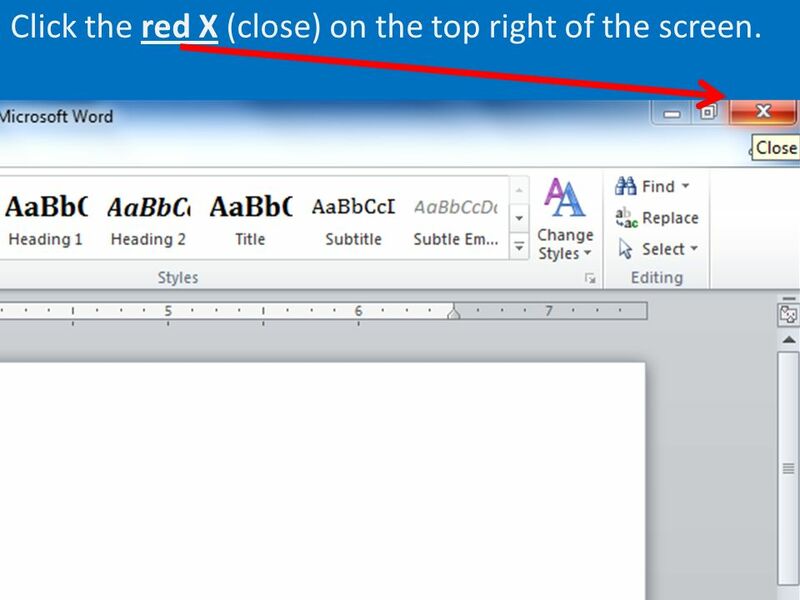 FOR MICROSOFT WORD 2010 AS VIEWED ON A PC SETTING UP THE RUNNING HEAD. 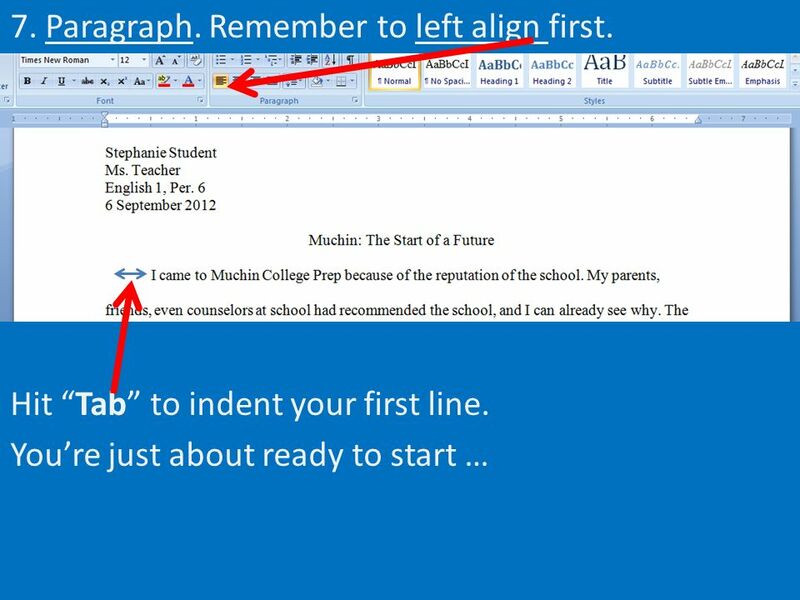 Microsoft Word Penguin Research Lesson 1: Typing, Font, Inserting Pictures and Inserting Textboxes. 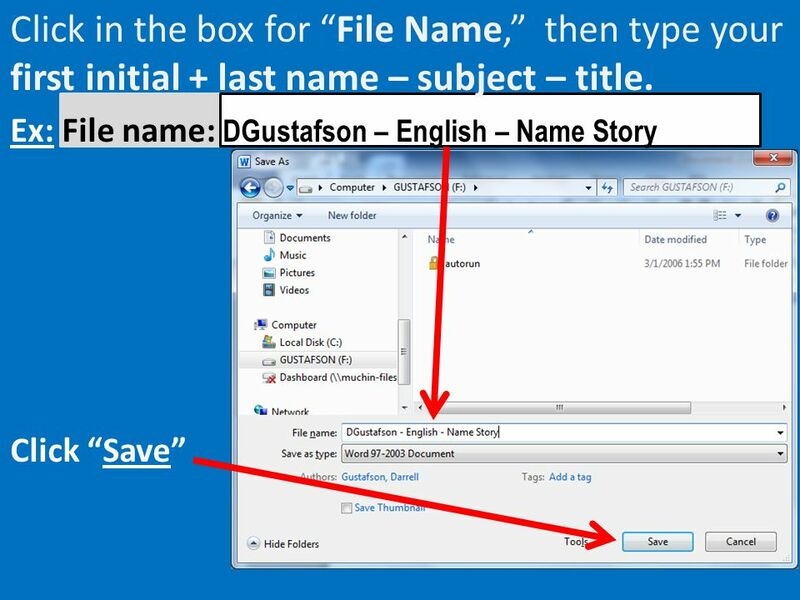 To open a new document, double click Word from the programs – or from an existing document, go to the file menu at the top left, and click new. Also from. Part 2 Lesson 2 Review. true 1. 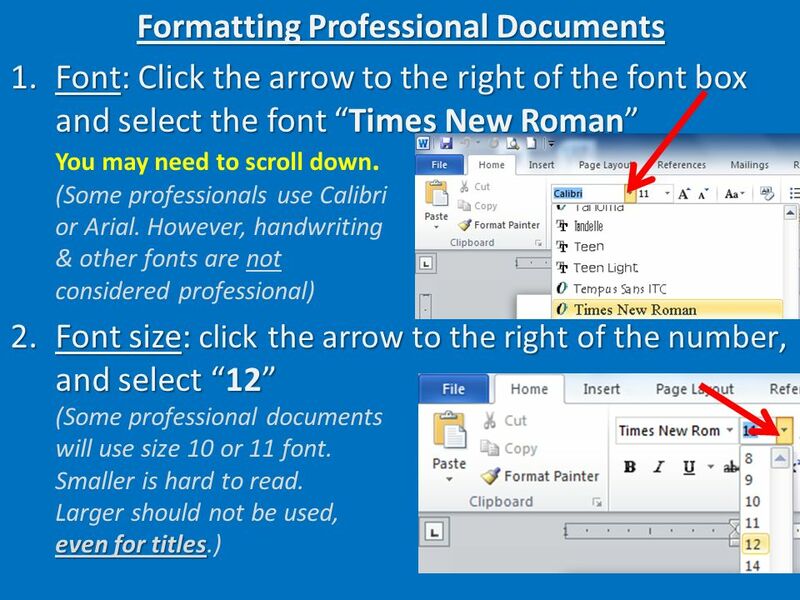 Creating well formatted documents is important because a document’s formatting is the first thing the reader will note. Create Turnitin.com Account  Enter quietly and login to computer.  Go to turnitin.com on your Internet Browser  Click on “Create Account” link in the.